Los Baños, Philippines – A consortium of agricultural and environmental scientists will soon be launching a program that aims to reduce methane emissions from rice production in target countries. 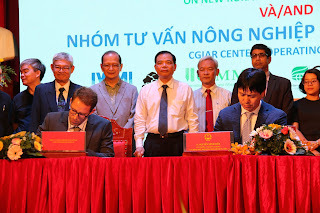 The International Rice Research Institute (IRRI), International Center forTropical Agriculture (CIAT), and partners will launch a new rice component of the Climate and Clean Air Coalition (CCAC), under the United Nations Environment Programme (UNEP). The launch is scheduled for 31 October 2014 in Bangkok, Thailand. It is widely known that impacts of climate change negatively affect rice cultivation, such as reduced yield from temperature increases. On the other hand, flooded rice fields exacerbate climate change as they are the second largest agricultural source of methane emissions globally. Together with national policymakers and nongovernment organizations, this new CCAC rice component aims to disseminate best practices to minimize methane emissions, particularly through the alternate wetting and drying (AWD) approach. Years of IRRI research show that AWD could reduce methane emissions by 30–50% and present other benefits such as efficient water use, improved rice yields, and reduced production cost. Compared with the common practice of continuous flooding, AWD enables farmers to periodically dry and re-flood their rice fields. The result is a significant reduction in water use as well as a reduced build up of methane gas in rice production. The technology makes use of a simple perforated plastic tube that allows farmers to observe water levels below the soil surface to know whether roots still have access to water and, in effect, whether it is the right time for irrigation. Through AWD, farmers can be confident that their rice plants receive sufficient water despite drying of the soil surface. Research and experience also show that there is no significant yield penalty with proper implementation of this practice. In combination with other measures, the improved application of this technique is referred to as AWD+. The program will focus on Vietnam and Bangladesh, two major rice-producing countries in Asia, and Colombia, the second biggest rice-producing country in Latin America. These countries represent vastly different types of rice production. Vietnam has very intensive rice production in the delta regions, with methane emissions estimated to be above 20% of all national greenhouse gas (GHG) sources. In Bangladesh and Colombia, this percentage is less than 10% and 1%, respectively. The 18-month program will establish a central information hub as basis for developing a network of demonstration sites to illustrate the benefits of AWD+. 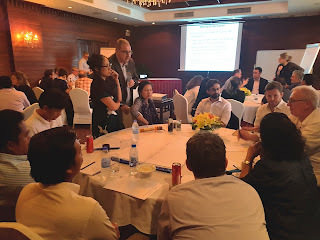 Program proponents envision technical and policy guidelines integrated into decision-support tools for implementing climate change mitigation initiatives in rice production. IRRI and CIAT are members of CGIAR, a consortium of 15 international agricultural research centers dedicated to a food-secure future. Within CGIAR, research work on climate change is coordinated by the Climate Change, Agriculture and Food Security Research Program (CCAFS). Oryza: Can you please highlight important issues in your research on climate change? Dr. Reiner Wassman: Climate change has many facets including changes in long-term trends in temperature and rainfall regimes with increasing year-to-year variability and a greater prevalence of extreme events. The impacts of these changing conditions on agriculture are already being seen, yet there are still considerable gaps in our knowledge of how agricultural systems will be affected directly or indirectly by the changing climate, and what implications these changes will have for rural livelihoods. At this point, there is simply not enough information available about the impacts at scales that are relevant for decision making and research prioritization, thus, having an adverse effect on the global net agricultural production. Climate change presents an additional burden on the world’s agricultural and natural resource systems that must cope with the growing food demand driven by population growth and higher incomes in developing countries. The challenge is compounded by the uncertainty and pace of climate change and its effects regionally. It is increasingly clear that climate change will affect agricultural productivity. The temperature and precipitation changes that accompany climate change will require farmers to adapt, but precisely where and how much is uncertain. At the same time, as a significant contributor of greenhouse gases and a potential sink for atmospheric carbon, agriculture can help mitigate climate change. Oryza: Can you please elaborate on the impact of climate change on rice-producing countries in Asia? Dr. Reiner Wassman: A gradual increase in temperature, as reflected in fewer cold days and more frequent hot days, is already discernable in most regions and will intensify in the future. In turn, higher temperature levels will further increase intensity and frequency of heat spells. This trend which is deemed almost certain for future condition has serious implications on agricultural production and human survival. Moreover, the increase in temperature will increase sea level due to (a) thermal expansion of sea water and (b) rapid melting of the glaciers and ice caps. As a consequence, fragile coastal and highly productive deltaic rice cultivation area will be more exposed to inundation and salinity intrusion. In the more immediate term, however, changes in extreme events may exert a stronger impact on agricultural production as compared to gradual change in temperature and precipitation. On the other hand, the predictions of extreme climate events under future climate conditions are attached to considerable uncertainty, but in any case rice-producing countries should be prepared to more climate extremes. Oryza: How does climate change exactly lead to increase in greenhouse gas (GHG) emissions? Which Asian country has the highest GHG emissions so far? Dr. Reiner Wassman: The cause-symptom relationship is (a) increase GHG emissions are causing (b) climate change – and not the other way around. Oryza: You have been highlighting the importance of Alternate Wetting and Drying (AWD) irrigation method in reducing GHG emissions compared to various other crop management strategies. How does the AWD technique reduce GHG emissions and how economical is it compared to other techniques? Dr. Reiner Wassman: Rice production is a source of the GHG methane which is produced by bacteria in flooded soils. Irrigating the rice paddy at distinct intervals without flooding during the vegetation period will reduce the emissions of methane. Oryza: Which rice producing countries have adopted this technique so far? How does this technique influence yields per hectare? Dr. Reiner Wassman: AWD has been developed as a water-saving technique and has been introduced through individual projects in several countries such as Bangladesh, Vietnam and the Philippines, but has not yet reached a broader dissemination. However, some similar irrigation schemes encompassing a single drainage period are part of traditional practices in China and Japan. Oryza: Do GHG emissions depend on cropping systems? What are the possible mitigation methods? Dr. Reiner Wassman: Rice is the only crop that is grown under flooded conditions, so there are no methane emissions from other crops such as wheat or maize. On the other hand, non-flooded crops emit more nitrous oxide, another GHG derived from nitrogen fertilizer, as rice production. Oryza: You have been developing decision support systems on mitigation/adaptation through mobile phone apps. In what stage is this research? Dr. Reiner Wassman: This refers to improved fertilizer (nitrogen) supply as a means to reduce nitrous oxide emissions. Some of these ‘apps’ are already in use in several countries but are still undergoing constant software improvements. Oryza: How do you integrate the socio-economic aspects into planning of Climate Change adaptation/ mitigation? What kind of support do you expect from various governments? Dr. Reiner Wassman: Farmer adoption will rely on incentives. For adaptation, we try to highlight improved resilience to current climate variability as opposed to the possible advantages to a (distant) future climate. Climatic problems such as drought and floods are already common in many regions, so that adaptation options such as tolerant rice varieties offer an immediate remedy. For mitigation, the benefits may not be so clear in the first instance because lower emissions do not render advantages as such. Incentives for adoption have to be derived from co-benefits, e.g. lower water demand. Depending on the specific situation of the farmer, AWD may save pumping costs or can lessen water deficits. Oryza: How does burning of rice straw contribute to GHG emissions? Dr. Reiner Wassman: Burning of rice straw causes environmental problems mainly in two ways: local air pollution and emission of methane. Rice straw is typically burned in piles on the field that entail incomplete combustion of carbon. One of the products of incomplete combustion is methane. Oryza: Does soil have any role to play in increasing GHG emissions? If yes, what are the mitigation methods? Dr. Reiner Wassman: Soil is the matrix for the methane-producing bacteria – as well as for the roots of rice plants – but soil is not the source of methane. Insofar, this seems to be the wrong target for mitigation other than water management. Oryza: How are you collaborating with the governments of various rice producing countries in educating farmers about the impacts of climate change? How do farmers respond to such counseling? Dr. Reiner Wassman: We see our role to provide technical expertise on adaptation and mitigation to policy makers. This policy advice is done at different scales, namely from local to provincial and national scales. 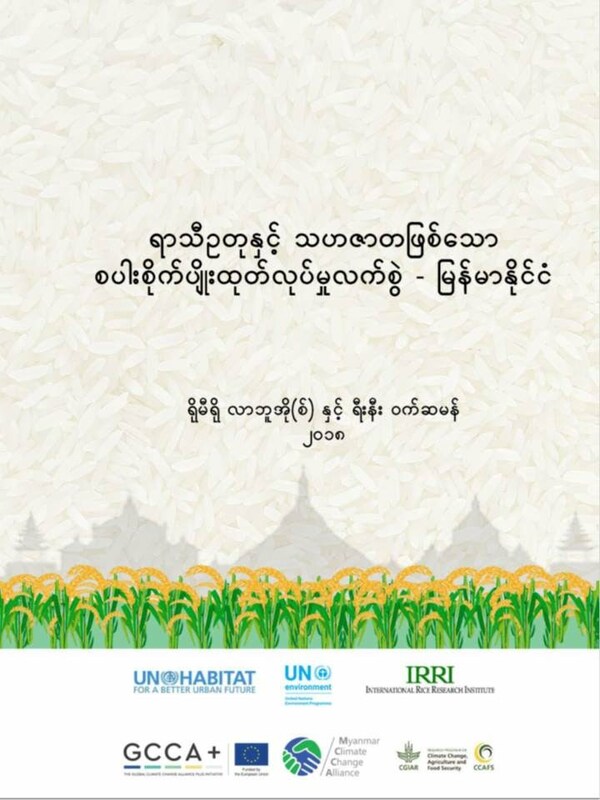 In some case studies, we develop ‘road maps’ on adaptation and mitigation consisting of (1) geographic hot-spots of vulnerabilities such as aggravating flooding and salinity problems where introduction of improved rice cultivars is imperative and (2) suitability maps displaying priority areas for dissemination of mitigation. The International Rice Research Institute (IRRI) is expanding use of alternate wetting and drying (AWD) technology among Angat farmers to help cut irrigation expense and reduce emission of methane to the environment. The practice of withholding irrigation for rice farms at certain stages has been proven to significantly cut farmers’ water use by up to 30 percent. Farmers around the Angat area in Bulacan should take advantage of AWD as they experience water dearth. “They get less and less water, so farmers have the interest to save water,” said IRRI Climate Change Head Reiner Wasman in a climate change workshop. Angat water’s priority is for household use, for drinking. As climate change worsens, manifested in increased occurrence and intensity of drought, irrigation for rice farming will have to compete with other uses of Angat water. That also includes power generation. As another benefit, AWD enhances ecological balance. “Flooded rice emits greenhouse gas methane. It develops when we have organic material in the soil, but no oxygen. AWD allows air to get into the soil. You don’t get methane formation,” said Wasman. Some farmers in continuously irrigated areas like those in Nueva Ecija may not find removal of water cost-efficient. “It doesn’t work in places where people are directly connected to canals like in Nueva Ecija,” said Wasman. Farmers pay a fixed price of around P2,500 per hectare for irrigation fee in National Irrigation Administration (NIA) areas, whether they use water measly or not. But some farmers in Tarlac who are trying to save on pumping water may also find AWD beneficial. In AWD, rice farms are only irrigated every two weeks. Fields are not constantly flooded. A pipe is inserted into the ground from which to determine whether soil moisture is depleted and would need irrigation. AWD will also be suitable in Bohol where there is a modern irrigation facility. IRRI may also work in rain-fed or upland areas where water is pumped, carrying diesel costs. Supply of water may also be less for those at the tailend of the dam, making them apt for AWD. As AWD is cost-saving and reduces greenhouse gas emission, the national government may find it advantageous to modernize irrigation facilities. Organizations may also eye accessing a funding facility called Nationally Appropriate Mitigation Action (NAMA). It involves a financing mechanism agreed by the United Nations Climate Change Conference in Bali in December 2007. There are now countries that take advantage of NAMA as a funding source including China, Brazil, India. Varieties with less resistance to lodging would also do well in AWD areas. When rice plants that are mature for harvest or nearing maturity fall to the ground during typhoons, and the soil is wet, these may render themselves unsuitable for milling. While rice production may get affected due to the impacts of climate change, rice farming itself is a contributor to climate change as a substantial source of greenhouse gases (GHGs), agricultural scientists said yesterday. They recommended that farmers use new irrigation technologies--Alternate Wetting and Drying (AWD) and Fertiliser Deep Placement (FDP) in rice farming to mitigate GHG emissions. These observations came at a two-day workshop on "GHG emissions from rice fields: Mitigation options from FDP and AWD", organised by International Fertilizer Development Centre (IFDC) at Bangladesh Agricultural Research Council in the capital. Dr Reiner Wassmann, senior scientist at the International Rice Research Institute (IRRI), presented a keynote paper on “Assessing the suitability of mitigation options in rice production derived from bio-physical considerations and stakeholder perceptions”. He discussed the benefits of the adoption of AWD, a technology for water-saving with the aim to reduce GHG emissions in rice fields. Around 21 percent of the total GHG emissions in Bangladesh occur in rice fields, he said. “Various altered crop management strategies have been suggested, ranging from the selection of potentiality low-emitting rice cultivars to proper post-harvest management, but AWD is still the most promising option,” he said. IFDC is researching methods to mitigate GHG emissions that result from lowland rice farming in Bangladesh. Rice farms account for 85 percent of Bangladesh's agricultural land and emit carbon dioxide, methane and nitrous oxide greenhouse gases. Moreover, inefficient fertiliser use in rice cultivation increases nitrous oxide and nitric oxide emissions. Yam Kanta Gaihre, deputy chief of the Accelerating Agriculture Productivity Improvement at IFDC, presented a paper on “Assessing the impacts of urea deep placement (UDP) on GHG emissions and mitigation potential under continuous rice cropping system”. UDP is a rising popular technology that can drastically cut nitrogen losses up to 35 percent and increases rice yield up to 20 percent, he said. Agriculture Minister Matia Chowdhury inaugurated the workshop as chief guest. Oryza.com - Agricultural researchers from the International Fertilizer Development Center (IFDC) and the International Rice Research Institute (IRRI) have recommended Alternate Wetting and Drying (AWD) and Fertilizer Deep Placement (FDP)/Urea Deep Placement (UDP) techniques to reduce greenhouse gas (GHG) emissions from rice fields in Bangladesh, according to local sources. Agriculture Minister Begum Matia Chowdhury urged the farmers of the country to adopt Urea Deep Placement (UDP) Technology in the rice field for making the country greener and safer from the global warming. 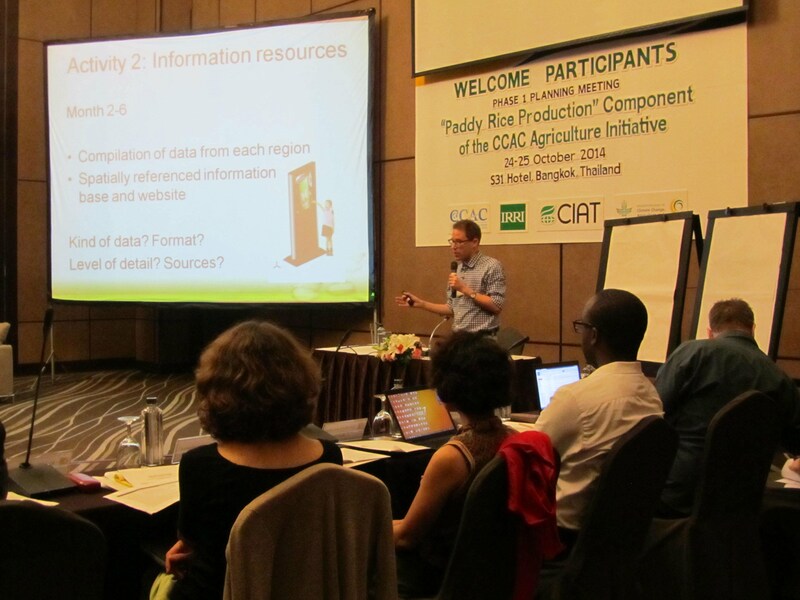 Meanwhile, Reiner Wassmann, head of IRRI’s climate change research, emphasized that, apart from the provision of tools and information to assess GHG and mitigation programs, how to engage the stakeholders to ensure practicality of results is another important concern.